Baja's Sea of Cortez is the world's most iconic winter sea kayaking destination, hands down. The reasons are endless. Warm, crystal clear water, spectacular desert scenery, sunny skies and an astounding variety of marine life including whales, dolphins, sea lions, sea birds and countless fish. These are just a few of the many reasons. When a place is iconic it also tends to attract a lot of visitors. But the Baja peninsula is big and there's room to spread out. Still, a few locations are more popular than others and offer less opportunity for solitude. So, we set out to find some locations that aren't as well known. While our most remote trip would be our Loreto to La Paz coastal paddle, our new Isla San Jose - Remote Island Paradise kayak adventure is a close second. It's just hard enough to get to, that it's off the radar screen of most kayakers. Our journey makes it easy for you and the bit of extra time and effort required to reach Isla San Jose is well worth it. Join us on this island paradise for a challenging kayak tour, fantastic snorkeling, superb hiking and the high likelihood of being the only group around. Fly direct to La Paz (LAP) or to San Jose del Cabo (SJD) and transfer north three hours to La Paz by bus, shuttle or taxi. Overnight in La Paz at the Seven Crowns Hotel and meet in the evening for an orientation with your Sea Kayak Adventures tour leader. We hand out waterproof bags to pack and answer all your last-minute questions. You also have time to explore the city, capital of Baja Sur, with its lively seaside promenade and many exceptional seafood restaurants. We meet in the morning and head north to begin our adventure, traveling through a fascinating landscape of huge cacti and rugged mountains. Our guides, all bilingual Mexicans from the area, are a fountain of knowledge, eager to share their home with you. By late morning we arrive at our starting point. If the weather is cooperating, we put in near Punta Coyote. If winds or rough seas are present we head to a small coastal fishing village where we may start our paddle, or camp on the property of a local fishing family. At the appropriate time we prepare the kayaks, adjust seats and foot pedals and have a safety orientation talk. Our hoped-for destination is a small island south of San Jose called San Francisco. It has an idyllic bay and easy introductory hike to the top of the island with views of the bays below and the azure Sea of Cortez. Depending on conditions we may spend the night here or continue to Isla San Jose. Either way there is time to swim and snorkel. As the light fades we sit down to a festive and traditional Baja dinner of fresh seafood, tortillas and more. The evening sky is soon studded with diamond-sparkling stars and sleep beckons. We rise early for a hearty breakfast and to start paddling to take advantage of the usually windless mornings. If we didn’t visit yesterday, we hope to visit another small island today located between Islas San Francisco and San Jose. El Pardito. This is a small rocky outcrop where several artisan fishing families live and we stop to learn about their life on this remote island. After a couple hours of paddling we beach our kayaks on Isla San Jose for a well-deserved break and chance to stretch our legs with a walk on a beach. This beautiful Sea of Cortez island has dozens of long beaches of golden sand, perfect for beach combing. Depending on our mood and sea conditions we may have lunch at our first landing, or continue a short distance more. After lunch we continue paddling another hour or so to our camp. Here you are introduced to our routine for the next few days. Arrive at camp, set up tents, take a swim or snorkel, go on a walk or, read a book. Relish the free time away from any phones or email. Disconnected from your world at home and totally connected with where you are and the people you're with. Soon it's time for appetizers, then dinner under the stars. Relaxed, physically tired and hopefully at peace with everything around you, you fall into a deep sleep. Warm rays from the rising sun awake you from your slumber. If that doesn't do it your guides wake you gently. We have breakfast on the beach, then pack up your stuff while your guides pack up the kitchen and camp. Then off we go into the inviting Sea of Cortez, one of the healthiest marine ecosystems in the world. We may see giant blue whales swim by, fin whales or orcas! Pods or dolphins sometimes play with us as we paddle and manta rays often soar above the surface. We paddle a couple of hours then stop when we find a welcoming beach for a long lunch with time for walking, snorkeling or sunbathing. After lunch, settling into the rhythms of island life, we paddle a bit farther to camp. Now familiar with our routine, we spend another glorious evening. Depending on weather, the group's interests and available hiking possibilities, we may have a layover day. Often people welcome the break from kayaking and the chance to give arms and shoulders a respite from working out. Isla San Jose has some amazing hiking trails including one that crosses the entire island. Reaching a high point on the island with expansive vistas over the azure Sea of Cortez, perhaps with whales blowing spouts in the distance, may be the highlight of the trip for you. There is also time for digging clams from the beach when the tide is low. Your guides lift the veils of mystery in the rich tidal areas. You might also enjoy learning how to fish with one of our guides who has a passion for this! Another day of adventure and relaxation. Weather permitting, we round the north end of the island and paddle along the eastern shore. This is a dramatic coast, adorned with cliffs, arches and secluded coves where you look into transparent waters to fish below. By now you are as one with this place. Life at home seems far away. We land and explore, on foot or snorkeling in the transparent water. Another scrumptious lunch. Another wonder-filled afternoon. A festive last night camp. We rise early and paddle a short distance. Then we load into our panga. We complete our circumnavigation of the island and cross back to the mainland. On arrival we have lunch, then load up into our van for the 2 ½ drive back to La Paz. Once at the hotel a warm shower feels great and, refreshed, we meet for a lively farewell dinner at a local restaurant and regale each other with tales of the trip. Our kayak adventure is done and we highly recommend you join our half day tour Swimming with Whale Sharks which includes another night at the hotel. Alternatively, you may start your travel home. Single Supplement: If you are a solo traveler and wish to have your own hotel room in La Paz (or we are unable to pair you up with another solo traveler), an additional single supplement of $105 USD is required. Solo travelers will always have their own tent during kayaking tours, at no additional cost. How do I get to La Paz? 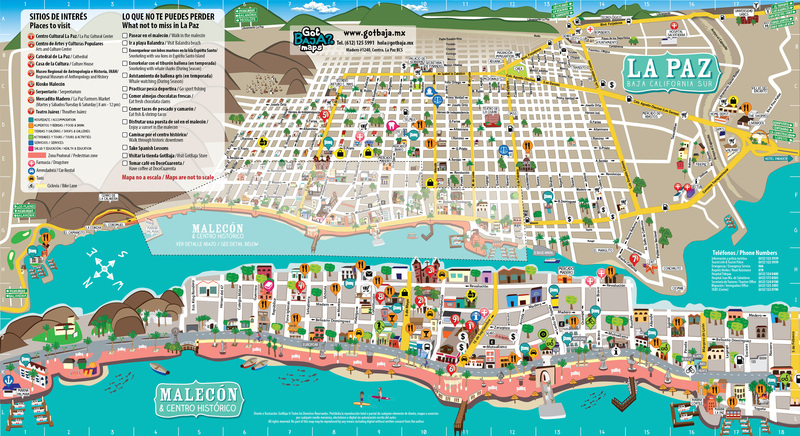 Please check out our Transportation Guide for our recommendations on how to get to La Paz. Included: Skilled professional guide services, ground transportation, motorboat-support to carry gear, hotel nights as indicated on itinerary, snorkeling equipment, camping equipment including tents, sleeping bags, liners, and sleeping pads. Our camping trips include all meals from lunch on the first day to lunch on the last day. Not Included: Airfare, transportation to and from airport, gratuities, $25 National Parks & Biosphere Reserves access fees required by itinerary, and items of a personal nature. We know your Guide will make the biggest difference on your trip! Which is why we pride ourself on employing only the best local guides for all of the incredible locations that we visit. Part of this is to support our eco-tourism efforts, but we also believe that there is no better way to experience a new destination than through they eyes of a local! We find talented and skilled local guides, train and certify them, and provide a positive and consistent source of income to them and their families. Most of our guides are with us for the long-term, despite the seasonal nature of the industry. Our top-notch equipment, unique itineraries, and perfected operations attract extraordinary guides, many of whom are highly sought after in the industry. ROW Sea Kayak Adventures guides know their outdoor skills as second nature. Each trip will have 2-4 guides to assist, inform, and lead the way so you get the most out of your adventure. They love to share conservation, knowledge, games and laughter - and they’re great cooks! Spring and fall are the most ideal times for yoga on the beaches of the Sea of Cortez, as the seasons are characterized by warm days, glassy calm waters for paddling, and endless sunshine. Fall trips enjoy the chance for a desert in bloom and warm water snorkeling, while during spring, many cetaceans migrate into the Sea of Cortez and sightings may include blue, fin, and humpback whales. In general, fishing in allowed in Loreto. You would need to obtain a fishing license either before arriving or upon arrival. Our guides will not allow fishing if you are unable to produce a valid license. You will also need to bring all of your own fishing equipment. Along our kayaking routes there are areas where fishing is allowed, the guides will let you know where fishing is prohibited. Also, fishing is only allowed at the guide's discretion, as we have an itinerary, schedule and other group members that we have to take into consideration. To keep our group size small and our impact minimal, we typically limit our tours to 14 people or less. Our standard minimum to confirm a departure is 4 guests for our San Jose kayak tour. If you will be extending your stay in lovely LaPaz before or after your tour, consider joining us for a day to snorkel with Whale Sharks. La Paz is home to a unique and prolific Whale Shark population. We partner with a local research and non-profit organization to facilitate these tours. Don't miss the adrenaline rush of snorkeling with these gentle giants, while simultaneously learning about this unique species. Please inquire with the office if you would like to add on a Whale Shark tour to your reservation.